Madrid attractions are as varied and numerous as the citys history would suggest! From the world famous art galleries to the equally important Culture and museums it is all here waiting to be discovered. Madrid contains the worlds largest collection of Picassos work as well as that of many other famous Spanish artists. Whether young or old there is plenty for the whole family. For the big kids amongst you we have even included a whole section dedicated to Madrids Sporting venues and clubs. If you want to see all the attractions in Madrid Spain and have the choice of entering and leaving at your leisure the newly released Madrid Card is by far and way the most economical way to do so. Madrids Monuments, Landmarks, places of "special interest". Call it what you will. All of Madrids central attractions in one place. Make sure you see them all and not just on the postcard you buy at the airport! Be sure to use the Free detailed guides for popular places in Madrid such as the Plaza de Colon, the captivating murals at the Historic Plaza Mayor and of courseone of the most popular free Madrid attractions is Retiro park! The two large theme parks in Madrid are easy to get to ensuring that the Kids won´t be bored. Check out our special madrid attractions for kids section for more details about this and other kids activities. Take the cable car on Madrids south side and see the city from a very different perspective! Conveniently located within 20 minutes walking distance of the city centre this is a novel way to reach the centre of Madrids biggest Park, Casa De Campo, and the Madrid attractions located there Theme Park, Zoo, & the venue of the Madrid Masters. With the 2nd largest bullring in the world the Plaza de toros in Las Ventas is a monument worth seeing in its own right! Of course that doesn´t stop you from watching one of the every summer Sundays bullfights should you so wish. 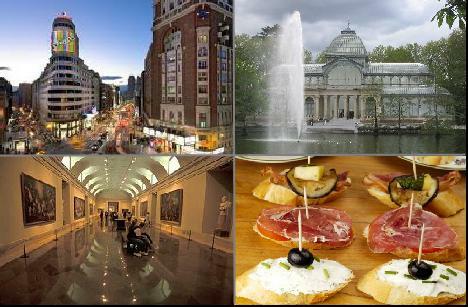 With ticket prices starting at as little as 3€ this is a cheap and interesting way to unlock Spain and Madrids culture! This is certainly one of the Madrid attractions you will not want to miss! Fancy somewhere cool and relaxing after all that walking? Madrids Natural history museum just off the Paseo de la Castellaña offers a full afternoons entertainment. Or maybe you want to understand a little more of Spains naval history including "Cristobal Colons" (Christopher Colombus) discovery of the Americas at the Museo Naval?